Santomauro, Josie, and Carter, Margaret Anne (2011) Set for Success: activities for teaching emotional, social and organizational skills. Jessica Kingsley Publishers, United Kingdom. To be successful in today's world, all children need to become competent in emotional, social and organizational skills. This engaging and easy-to-implement resource will be an invaluable tool for teaching these essential life skills to children of all abilities. Each chapter is subject-themed, and includes a checklist of objectives, lesson ideas, activities and fully-photocopiable worksheets. 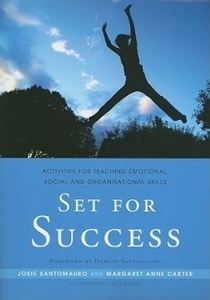 From developing organizational skills by making use of timetables, reports and note-taking, to promoting self-esteem by creating acrostic poems, "Set for Success" offers a series of structured yet fun-filled exercises that cater for all learning styles and levels of emotional and social proficiency. This practical resource is ideal for children aged 3-10, but many of the activities can easily be adapted for older children who need extra support in developing emotional, social and organizational skills. Introduction; 1. Getting Organized; 2. Being Persistent; 3. Becoming Confident; 4. Connecting with Others; 5. Regulating Emotions; 6. Attaining Independence; 7. Communicating Respectfully; 8. Relaxing and Energizing; 9. Rights and Responsibilities; Conclusion.